The Los Angeles Pilot Station is staffed 24 hours a day. Pilots board arriving vessels from the pilot boat in the vicinity of Los Angeles Channel RACON Buoy #3. Tank vessels are boarded at least two miles from the Los Angeles entrance. Deep-draft vessels (more than 55 feet) are boarded in the vicinity of Los Angeles Channel Buoy #1. Under normal weather conditions, the pilot ladder should be rigged on the starboard side one meter above water. A minimum of two hours’ advance notice is required for Port Pilot service. Masters or agents are requested to advise the Pilot Station when there is a change in the arrival or sailing time. 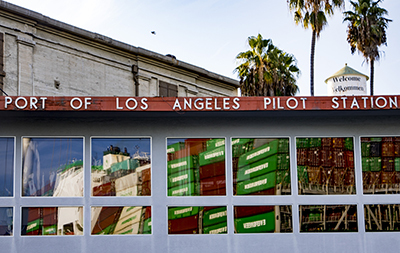 Founded in 1907, the Los Angeles Pilot Service is a team of nearly 30 dedicated professionals including pilots, dispatchers, boat captains, and deck hands. Their mission is to provide safe, reliable, and efficient vessel transit for Port of Los Angeles customers. In any given year, the Service works around-the-clock piloting roughly 3,600 arriving and departing vessels. The Los Angeles Pilot Service is the only piloting organization in the nation staffed solely by government employees. After a rigorous two-year training program, each pilot continues their education by attending ship simulator training every two years as well as manned-model ship-handling courses in Grenoble, France every four years. Over the last decade, these highly trained professionals have safely completed more than 55,000 vessel movements within Los Angeles Harbor. Published annually in the fourth quarter of the year, the Port of Los Angeles Mariners Guide provides vital information for those who operate ships and small boats in and around the Port of Los Angeles. It is a helpful, easy-to-use guide to provide a safer navigational experience and includes annual tide tables, construction information which impacts weather, water conditions and safety, U.S. Coast Guard requirements, and a directory of maritime support services with current contact information. It also contains technical information for merchant mariners and essential information for small boaters and water enthusiasts. All ship traffic coming and going in and out the San Pedro Bay Port Complex is monitored by the Marine Exchange of Southern California. The seaport equivalent of an air traffic control center, the Marine Exchange's primary services are its Vessel Advance Arrival Reports and its Vessel Traffic Service that monitors all ship movements within 100 miles of the San Pedro Bay. From the Marine Exchange's hilltop headquarters on Coast Guard property, operators use state-of-the-art technology to track nearly 5,000 vessels annually -- everything from containerships to pleasure craft -- calling at the ports of Los Angeles and Long Beach. Everyone from the docks to the cargo's final destination relies on its real-time data to pinpoint the position of inbound and outbound vessels. The Marine Exchange sits on one of the highest points in San Pedro with unobstructed southeast exposure and has detailed records of every inbound and outbound ship since it launched operations in 1923. Contact the Marine Exchange at (310) 519-3134 or [email protected].